How do I integrate the LiveCall widget with a number that has voicemail on it? When setting up your LiveCall widget you chould check whether you have voicemail set up on your number. If that is the case, then a callback rejected by you will activate your voicemail. The software will treat reaching the voicemail as if the call had been answered, and your lead will be dialed. But they won&apos;t be able to speak to you. Luckily, we can prevent that from happening! 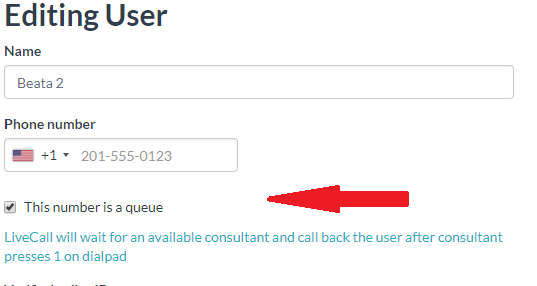 In order to avoid such situations, go to Users, edit the user who has voicemail active, and check the "This number is a queue" checkbox (see below). Now your voicemail won&apos;t trigger callbacks! Call agents will have to press "1" on their numberpad in order to dial the lead. Note: This feature is also used for customers who have a queue set up, e.g. in call centres.